The engine on Triumph Bonneville / Scrambler / Thruxton is simple, of high quality and known for its reliability. To maximize its life, it is necessary to change oil strictly according to the regulations or even more often. The manufacturer recommends to change the oil for the first time at 800 km after the purchase of a new motorcycle, and then at each 10,000 km or once a year. The oil shelf life is usually 5 years, but only if it is stored in a sealed package at a stable temperature. When the motorcycle is parked, condensate and oxides form in the engine, which reduce the quality of the oil, which is why it must be changed at least once a year, even if the mileage is less than 10,000 km. Choosing the right oil is not as hard as it may seem. The manual accurately specifies the requirements for it: synthetic or semi-synthetic oil with a viscosity of 10W40 or 15W50, matching the API SH specifications or higher. For Russia, the 10W40 is better, the choice of the oil type is individual (based on our experience, the gear box works softer on the semi-synthetics), the API SH specification is so old that finding the corresponding modern oil is difficult (most oils on the market meet higher specifications). The brand does not matter. It is important to properly maintain the motorcycle according to the regulations, and not to look at the prices and labels of canisters in a store. Replacement can take place more often if the motorcycle is operated in dust or when there is a large temperature difference. Any motorcyclist wonders why oils with the same characteristics cost differently. There are only a few full-cycle companies in the world: Shell, Total, Mobil, BP, Petro Canada, Neste, Statoil, etc. These companies produce oils themselves, have advanced technologies, and their products will be fair in terms of price/quality ratio. All other brands are mixing manufacturers that buy base oils from full-cycle companies and occupy unpopular market segments, which is why their products are often more expensive. When changing the oil according to the manual, it is recommended to change the washer on the drain bolt, but experience shows that this is not required and it does not leak. Modification T100 is not equipped with a central lift, so when evaluating the oil level, the motorcycle must be put in a vertical position. 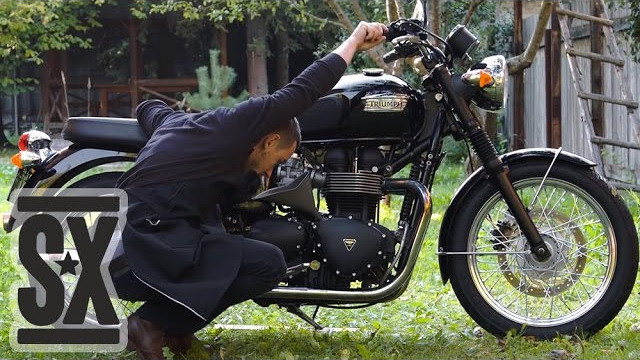 In general, the Triumph Bonneville oil change procedure is standard. The main thing is to remember to fill the filter with oil, tighten the drain bolt and check the level.